Andrews was left with a bloodied face after the collision. DUBLIN FORWARD Paddy Andrews has undergone surgery after suffering a fractured jaw in a clash with Tyrone keeper Niall Morgan in Croke Park on Saturday. Andrews was in a race for possession along the Hogan Stand sideline in their Division 1 meeting, when he shipped a heavy blow from Morgan’s badly-timed shoulder challenge. The St Brigid’s star was left with a bloodied face after the foul and was immediately stretchered off. Dublin manager Jim Gavin subsequently told reporters that Andrews was brought to hospital with a head injury. RTÉ Sport’s Darren Frehill has since reported on Tuesday’s Morning Ireland that Andrews has had surgery after sustaining a fractured jaw as a result of the collision. That injury will rule him out of St Brigids’ club championship games which are coming up in the next three weeks. Morgan was handed a yellow card by the referee for the challenge on Andrews, meaning his punishment cannot be reviewed by the GAA’s Central Competition Controls Committee (CCCC) as it was dealt with at the time. Dublin’s loss to Tyrone at the weekend was their third loss of this year’s Allianz League campaign, which rules them out of the hunt to defend their Division 1 crown. This will be the first time since 2012 that Dublin will not feature in the league final. 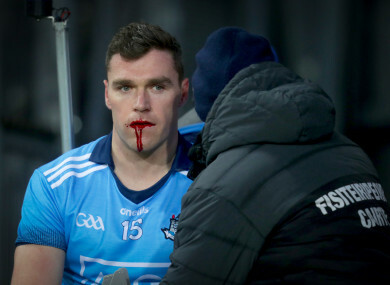 Email “Dublin ace forward undergoes surgery for fractured jaw following clash with Tyrone keeper”. Feedback on “Dublin ace forward undergoes surgery for fractured jaw following clash with Tyrone keeper”.